Save time with this collection of straightforward, common-sense techniques that provide quick, accurate solutions to your engineering problems. 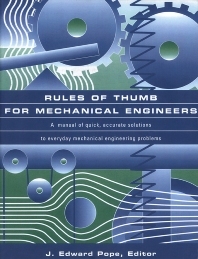 Rules of Thumb for Mechanical Engineers assembles hundreds of shortcuts, calculations, practical "how-to" methods, and concise background reviews into one convenient volume. Whether you're concerned with design, selection, or performance, you'll find fast, accurate answers here - all without wading through pages of theory. Experts from all engineering disciplines have packed this book's sixteen chapters with design criteria and practical tips. You'll find easy-to-read descriptions on fluids, heat transfer, thermodynamics, seals, pumps, and compressors, drivers, gears, and bearings, as well as piping and pressure vessels. Also covers tribology, vibrations, materials, stress and fatigue, instrumentation, and engineering economics. Hundreds of shortcuts, calculations and practical "how-to" methods in one convenient volume. Fast, accurate answers to design, selection, or performance issues. Bearings. Engineering economics. Fatigue. Fluids. Gears. Heat transfer. Instrumentation. Materials. Pipelines. Pumps. Seals. Stress. Thermodynamics. Tribology. Conversion tables. J. Edward Pope holds a Ph.D. in aeronautical and astronautical engineering from Purdue University. He has over twenty years of experience in the gas turbine industry, specializing in heat transfer, fatigue, and stress analysis.